Many picture books offer opportunities for children, and even adults, new to English to explore both the written and spoken language they are acquiring. How picture books are put to this purpose requires sensitivity to potential learners and wise choices of books to use. English language learners represent a wide range of ages, life experiences, literacy levels in their home languages, and–just as important–linguistic and cultural histories. Many speakers of Latin American Spanish dialects, for example, may indeed be learning English as a second language. However, those coming to North American English from the Indian subcontinent and some Northern African cultures probably are conversant in multiple languages already and thus have a different skill set to use when learning yet another–third, fourth, fifth–language. Working with English language learners who are present in classes with native speakers also draws attention to the need to be inclusive, rather than focusing attention on the use of specific books as a means of gaining English fluency. With these varying potential student needs in mind, how and why can picture books become part of the learning experience? One example of how such picture books can expand upon the English language learners’ current strengths is through the creation of a neighborhood map, as do the friends featured in Gecko Press’ Detective Gordon: The First Case. This kind of activity works well for the English language learner who is mainstreamed with native speakers and is based on observation and documentation through drawing. A group of English language learners who may share no language other than beginning English may find that the game of What If…? as is suggested by discussions in No Starch Press’ The Incredible Plate Tectonics Comic, provides the opportunity for sharing information about their own experiences with earthquakes, work together to create a model that expresses possibilities, and expand their academic understanding both of STEM-related content and articulating ideas in their new language. Building empathy into the experience of sharing picture books in a group that includes English language learners and native speakers can also expand everyone’s horizons. 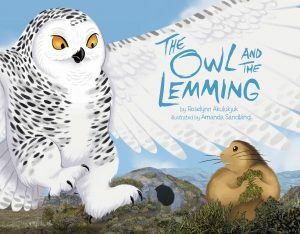 Inhabit Media, a wholly owned Inuit publisher, includes titles that are published in Inuit as well as English. The written language is unlikely to be familiar to anyone in the group, giving all a level playing field for understanding how an old language may be new to this reader. What activities do you find comfortable for new English speakers and readers when you share and expand their reading choices? We’d love to hear from you!